To meet the need for a separate solution to target silent roamers, Taisys Technologies has built the slimduet virtual SIM over-the-air download platform as an MNO-centric, digitised management and distribution hub for prepaid services. 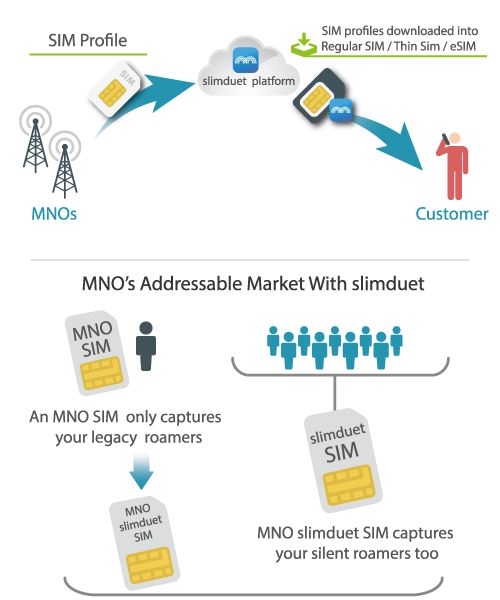 The slimduet downloading engine is at the heart of this solution, and allows SIM profiles to be downloaded onto all forms of SIM cards: regular SIMs issued by MNOs, thin SIMs, and embedded SIMs (eSIMs). It is designed first and foremost to enable MNOs to “wake up” silent roamer revenue through SIM cards supplied by the MNO, while keeping legacy roaming pricing and revenue through existing legacy roamers. slimduet allows MNOs to be interconnected globally in order to deliver roaming services to customers anywhere in the world. MNO offers its competitive local package on the slimduet platform and increases prepaid market share. Expand point of sales overseas before traveler arrives. Online KYC solution provides efficient user registration process. MNO prepaid package is distributed and delivered digitally worldwide via the slimduet platform, saving costs on logistics, warehousing, distribution channels, and more. Leverage global distribution and alliance network with minimal opex required. MNO benefits from easy adoption of slimduet solution with slimduet applet on MNO SIM. Platform adoption with zero capex involved. Offers postpaid & prepaid subscribers slimduet enabled SIM as alternative roaming service. MNO issued SIM that captures both legacy and silent roamer revenue. MNO collects silent roaming revenue. Market segregation – MNO’s second brand. Ability to purchase in advance a prepaid package based upon the country to be visited (multiple countries if required), anytime, anywhere. Able to advise friends and family of the local number before setting off. Local number at destination for ease of local communication. ICF/IP call forward functionality to ensure uninterrupted connectivity with home SIM. Avoid language barriers with a user-friendly interface. No queuing at the airport or reseller to buy a local SIM card. Register “know your customer” (KYC) if required on the application before departure. Select and buy a package suitable for the intended stay. Activate the package upon arrival. Once set up, slimduet® can be reused for years to come.